Back-Up Story: "History of the Multiverse - Chapter Three"
Jimmy Olsen dreams he's another brick in the Source wall of New Gods lore - or is it a dream? In Metropolis, Holly Robinson - the substitute Catwoman - fends off an attacker. She considers contacting her old friends but smashes her cell phone. Crying, she vows that she's in Metropolis to start a new life as she walks by the Athenian Women's Help Shelter (introduced several months ago in "Wonder Woman"). In Gotham City, Mary Marvel insists her meeting with Black Adam was accidental and that she doesn't want anything from him. Adam accuses her of lying - to herself if not to him. He tells her that she's like him - desperate, empty, and alone. Mary insists there is still hope. Adam lashes out at her. At the multiversal nexus, the Monitors debate the actions of the one who killed Duela Dent. The Monitor who killed Duela rallies a large group behind him by arguing that a new crisis is coming in the form of a "virus poised to infect the Multiverse irrevocably!" He says that Donna Troy, Jason Todd, and Kyle Rayner are the source of the virus. In Keystone City, the Rogues are partying in a penthouse. On the terrace, the Trickster and Pied Piper talk about why each of them is taking part if they each supposedly reformed. Trickster explains that FBI work is boring and that it's basically harmless being a Rogue anyway, harmless but fun. He explains that, if the Feds find out what he's up to, they'll just assume he's undercover. Piper explains he doesn't like most of the Rogues and really hates Mirror Master. Linda Park and Wally West were the only family that meant anything to him and, without them, all he has are the Rogues. Back in Gotham, Adam asks Mary if she wants to die. She says that she just wants her old life back but he makes her an offer. He calls out "Shazam!" and turns back into Teth Adam - but at the same time, he's bequeathed his powers to Mary who now wears a black costume with a white lightning bolt - and she appears to be older. Mary asks Teth what she can do and Teth says "If you see your brother, tell him I'm 'sorry'." In Washington, DC, the Amazons have returned and are attacking the city. The Monitors continue to review the history of the original DCU Multiverse beginning with the JLA's and JSA's first confrontation with Earth-3's ill-fated Crime Syndicate of America. Next, the JLA and JSA teamed up to stop the Earth-1 Johnny Thunder from using the Thunderbolt to prevent the original JLA from gaining their powers. Then, the two teams met to prevent their Earths from colliding due to the Anti-Matter Man. Earth-2's Spectre and Earth-1's Atom (Ray Palmer) played pivotal roles in this adventure. Main Story - 3: I am really enjoying the Mary Marvel story so far, but only because my fervent hope is DC will be smart enough to have Ms. Marvel's arc conclude with her re-embracing her innocence. I'm guessing that Black Adam figured out what Billy changed his magic word to - well he must've since he got his power back and got his word changed back to "Shazam" - and that the word was "Sorry", explaining why he tells Mary to tell Billy he's "sorry." A friend told me that it was explained on another website that Adam's back-story will be explained in his upcoming mini-series. Even being a website writer and editor myself, I have a problem with unexplained plot points requiring readers to get their fill-in-the-blanks from the internet; DC loses points in my book for that. Jimmy Olsen's story is, at this point, so confusing - much like the famous "Superman's Pal, Jimmy Olsen" New Gods arc that served as its inspiration -- that I'm (for now) reserving judgment. Holly Robinson left "21 Jump Street"... sorry, that's a different Holly Robinson. This Holly Robinson is a friend of Selina Kyle's who spent several months substituting for Selina as Catwoman while Selina's been a full time mother to her new daughter Helena. 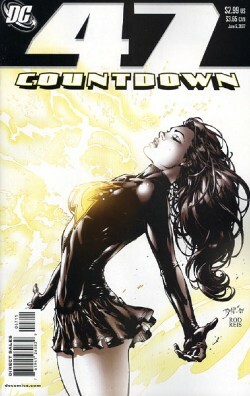 I think a better job could have been done introducing the character in "Countdown" for those who don't read "Catwoman" - not to mention the fact that the events that precipitate her leaving her friends in Gotham behind haven't yet played out fully in the "Catwoman" title. It's nice to see a "Wonder Woman" crossover - "Amazons Attack" - actually playing a part in the bigger crossover of "Countdown". Rumor has it "Amazons Attack" was originally conceived as a fifth part of the lead-up to "Infinite Crisis" along with "Day of Vengeance", "The OMAC Project", "Rann-Thanagar War", and "Villains United". It works better here after the Amazons left our reality during the second "Crisis". The Monitors - and DC - also need to start explaining themselves. Exactly how did Duela Dent cross over from one Earth to another? Is it being suggested Jason Todd, Kyle Rayner, and Donna Troy did the same thing, or is it that they were simply born on the wrong Earth? Main Art - 4: The penciller is the same guy who did the last arc in "JLA" before that book ended and was re-started as "Justice League of America". Either his work's improving or he wasn't as rushed on this issue but I especially liked his work on Black Adam and the now Black Mary Marvel. Back-up Story - 4: Just imagine the greatest heroes of multiple Earths teaming up to stop cosmic catastrophes! DC is finally making every adventure count. I can't wait to see the upcoming first meeting of Kal-El of Earth-1 and Kal-L of Earth-2. I never bought into the reasoning that the DCU Multiverse was too confusing - most comic book readers are well versed in the science fiction staple of parallel worlds after all. Back-up Art - 4: It's a double dose of nostalgia with the story itself bringing back my favorite JLA/JSA crossovers - that is, all of them - and with Dan Jurgens drawing the Man of Steel again. I'm enjoying this history lesson much more than the lame one done as a backup feature in early issues of "52" with Donna Troy. Cover Art - 5: Lucky me. I get all the best covers to review. Last time out, I reviewed the cover with the Joker and Jimmy Olsen's press pass and said it was such a pretty cover that DC was using it to market the series. This time out, it's Black Mary Marvel, a cover so hot it's also being used to market the series. Well done.